I recently spent some time with PRNews editor Steve Goldstein. As part of a fireside chat we’re doing at the upcoming 20/20 Summit in San Francisco, Steve asked a few questions that lead to a pretty deep conversation. I wanted to share it with you here. PR News: In your book “What’s the Future of Business?” you suggest that while it’s a good thing that companies are investing more resources in managing their online reputations, the cost can be immense and the efforts are rarely aligned with customer expectations. What are many companies getting wrong in their engagement with customers and stakeholders? Brian Solis: Companies are still bringing a dictator-like approach to engagement. They’re still broadcasting instead of communicating or participating. It’s still “we speak, you listen.” Public relations, marketing and social media teams still try to own the conversation rather than invest in it, shape it or become part of it. It’s almost as if we put the “me” in social media and not the “we” in the social web. This is about relationships and people, not about marketing, sales or corporate communications. The more we remember that we are part of the networks as human beings, the more we can act as human beings and not as corporate functions. PR News: If, as you have written, businesses should shift their engagement from being reactive online to creating positive experiences, what should PR and marketing professionals do to lead that shift internally, given that they don’t always have a seat at the table with senior management? Solis: The element that’s missing the most is that of empathy and understanding. Most PR pros and marketers act without understanding or build without knowing what the complete experience is of their brand as it exists today. They just keep shoveling new and creative campaigns and material into this fire for fear that the fire would burn out otherwise. Without knowing what that experience is right now we can’t honestly know what needs to be fixed or have a vision of what that experience should be. And that’s what all of this change is about—it’s about becoming experience architects and using technology, creativity and empathy to build better experiences and relationships. When PR and marketing pros have empathy with their audience they’ll have confidence, and when they have confidence they can create a sense of urgency and opportunity with senior leaders around the need to change. Executives have a hard time appreciating what needs to change because they don’t live their brand the way their customers do, and if they don’t live it they can’t understand why adapting to evolving audience expectations is so important. PR News: You point out that the way people connect and communicate has changed, and only those organizations that can adapt to these changes will survive. Taking that to the personal level, what must professional communicators do to survive and thrive? Solis: Digital Darwinism is very real. And it supposes that technology and society evolves with or without us. Unfortunately, I see many PR pros and marketers trying to take their prior experience and apply it to this digital world. The future of our careers and our role in both the revolution and evolution is to start with an open mind to see what’s different, to see how things have changed. And then develop strategies that move us in new directions. Much of what’s taking place today evokes common psychological responses such as denial, skepticism and derision. Unfortunately that gets in our way of seeing where we can learn and change in a world that is changing before us. PR News: What is one takeaway you want Social Media 20/20 Summit attendees to bring back to their daily tasks? Solis: I’m reminded of a Tolstoy quote: “Everyone thinks of changing the world, but no one thinks of changing himself.” What I want people to take back is to realize that they can’t sit and wait for someone to show them the path forward. This is a time where the people in that room in San Francisco and the people reading this now have to realize that change happens because of them—because of what they’re going to do to change the future right now. 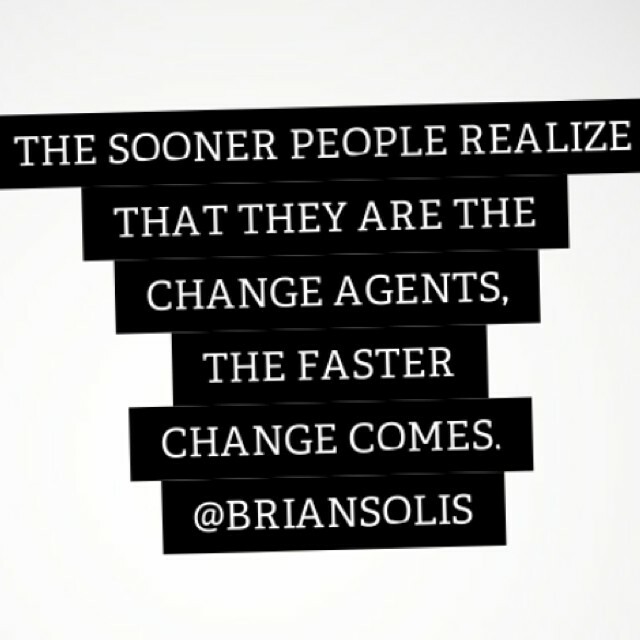 The sooner people realize that they are the change agents, the faster change comes. *[Megginson, Leon C. (1963). “Lessons from Europe for American Business. IMHO, Conway’s Law is another way to explain how enterprises act in social media. First, the “We” must evolve inside corporations. Open and permeable systems would then also change communication patterns with the outside world. That’s what struck a particular chord with me also. When working with social media I think that it is all about the relationships we build. Brands need to have a personality that is approachable. I think personalities are the new benchmark for Social. But most large companies want corporate – not individuals to stand out. That’s the shortcoming in many social strategies. People want to connect with people – not PR. Take a big brand like Coke – who is their personality – 20 somethings jumping on an ocean trampoline with no voice? Contrast that with Virgin… and you know exactly who people are following and engaging with. Great article. Your book sounds fantastic. I’ll have to check it out. Social has to be approached like a startup approaches introducing a new product or service. Market fit has to be found, and that can only be achieved through listening/understanding your target market. After this is achieved strategies can be derived that help communicate the product to the identified market. But listening never stops because we don’t live in a static world. It would be great if someone came up with systematic steps for listening online. Could be helpful for people trying to do this properly. Dag nabbit good stuff you whaerersnipppps! Thanks for sharing your ideas. Keep writing on the same tone.